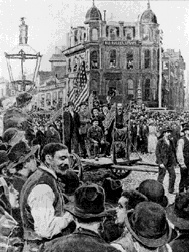 Kearney speaks to 2000 workers in front of Crocker Mansion at top of Nob Hill, Oct. 1877. 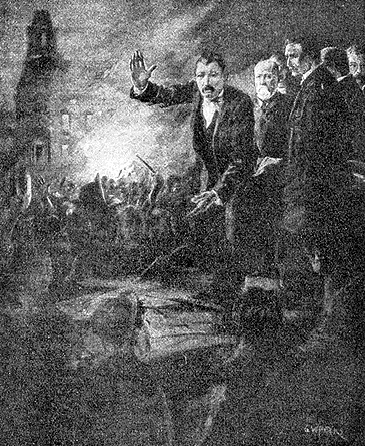 Dramatized rendition of speech by Denis Kearney in 1877, denouncing Chinese workers and capitalists in equal parts. Recorded by Haight Ashbury Community Radio Project, 1980. During the height of the 8-hour movement, radicalized white workers denounced capital and the owning class, but they also were already blaming “coolie” labor for dragging wages downward. The completion of the Transcontinental Railroad led to a big influx of skilled Chinese workers, who came to dominate employment in cigar making, shoe making, and textiles. Thousands of white workers came to San Francisco during this same period, seeking work out west in the wake of the economic depression back east. But the railroad brought the depression along with the workers. The official speakers spoke against Capital, and against granting franchises, and land and money subsidies to private parties, and so on. But when no mention was made of the Chinese (scapegoated by white workers as "coolie" labor, driving wages downward, but also the object of widespread virulent racism), a crowd of toughs from a neighborhood “ward club” (the local structure of the Democratic Party) invaded the rally. Before long an angry mob stormed off and by the next day over 20 Chinese laundries had been destroyed, as was a plumbing shop, and the Chinese Methodist Mission was stoned. It was the worst riot San Francisco had ever had at that point. Within two days, the Committee of Safety had organized 4,000 members into a “Pick-Handle Brigade” which dissuaded rioting whites from burning the Pacific Mail docks, though the mob set fire to a nearby lumber mill, and attacked those who tried to control the blaze. A fierce battle with dozens of police charges finally managed to route the rioters, leaving four dead, and fourteen wounded. 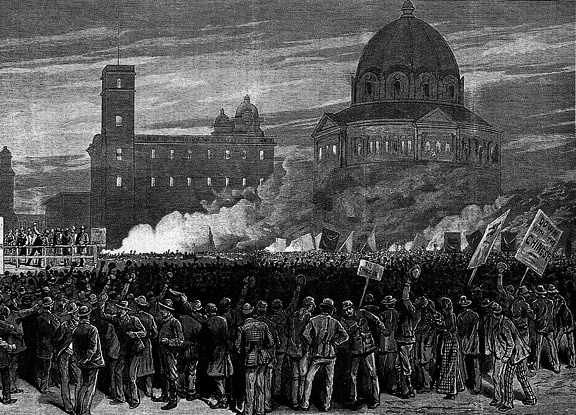 Smaller riots and fires took place in other parts of the city. The Pick-Handle Brigade suppressed the violence and three days later, the California governor telegraphed the U.S. Secretary of the Navy that the danger had passed. One member of the Pick-Handle Brigade was an Irishman named Denis Kearney. His political ambitions, however, helped him see that a Labor Party would be a better vehicle for his goals than any other. He was rejected on applying to the Workingman's Party of the US, since its leaders knew of Kearney's contempt for the working class. Kearney went off and started his own party in August 1877. After he began making provocative speeches in the sandlots in early September, Kearney gained support rapidly. Kearney's rhetoric grew more violent. On September 21 he predicted that within a year San Francisco would have over 20,000 armed workers ready to take what they wanted. A little judicious hanging would be the best course to pursue with the capitalists, he urged. By October, the slogan “The Chinese Must Go” was being widely repeated. Kearney founded another party, the Workingmen's Party of California, which eventually absorbed the older chapter of the U.S. party. Followers flocked to the new party, and as membership climbed, the speeches became more incendiary. On October 29, 1877, several thousand marchers surged up Nob Hill to the front of the Crocker Mansion. Denis Kearney spoke: “The Central Pacific Railroad men are thieves, and will soon feel the power of the workingmen. When I have thoroughly organized my party, we will march through the city and compel the thieves to give up their plunder. I will lead you to the City Hall, clean out the police force, hang the Prosecuting Attorney, burn every book that has a particle of law in it, and then enact new laws for the workingmen. I will give the Central Pacific just three months to discharge their Chinamen, and if that is not done, Stanford and his crowd will have to take the consequences. I will give Crocker until November 29th to take down the fence around Jung's house, and if he doesn't do it, I will lead the workingmen up there and take it down, and give Crocker the worst beating with the sticks that a man ever got.” (Evening Bulletin, 11/5/1877). Kearney is triumphantly pulled through the streets after his release just before Thanksgiving, 1877. “Everything must be made subservient to the rights of labor. It must be done even if we have to paralyze nine-tenths of our factories. We intend to emancipate labor. Capitalists must succumb to the working-men. I caution these men that the people are already on the verge of starvation... The young people will rise in this anti-Chinese movement and deluge this city in blood, if not entirely destroy this city. We shall show them that the days of the capitalists are over.” (Evening Bulletin, 11/5/1877). On November 3, the city authorities had Denis Kearney arrested as he spoke publicly on the street, for utterances “having the tendency to cause a breach of peace." Several more times the leaders were arrested and subsequently released when the courts disallowed their prosecution on various technical grounds. On Thanksgiving Day a crowd of between 7,000 and 10,000 workers marched in protest of the Chinese and in honor of the liberated martyrs of the sandlots, but as Saxton noted, the large majority of marchers in this Thanksgiving Parade were not workers' organizations, but rather language-association anti-Coolie clubs and neighborhood groups (German Club of 2nd Ward, French Zouaves, Scandinavian Association, etc.). Internecine warfare among Workingmen's Party factions led to months of fighting and dissension within the movement. Socialists grouped around Frank Roney controlled the Party's Central Committee but Kearney continued to hold personal sway through his ability to mobilize supporters. Denis Kearney's dictatorial style rankled many, and when they tried to remove him, he used his capacity for intimidation to close a number of ward clubs and affiliate chapters until he had regained control. In late January 1878, the Workingmen's Party of California held its first statewide convention in San Francisco. The platform declared that the government of the U.S. had fallen into the hands of capitalists and their willing tools with the results that the rights of the people, their comfort and happiness, were entirely ignored; coolie labor was a curse to the land and should be restricted and forever abolished; land should be held for cultivation and settlement only; a system of finance uncontrolled by rings, brokers and bankers, should be introduced; the eight-hour day should be made the legal workday; the farming out of convict labor was condemned; the accumulation of millions and the existence of monopolies should be made impossible by a new tax system. This platform, while still expressing hostility to the Chinese, was part of a general diminishing of the racist focus of the Party, as its energies came to be more directed against monopolies (especially the railroads) and Capital. San Francisco was tense with anticipation by early 1878. Class war was in the air, but an air choking on racism. The summer before had seen an uprising in most eastern railroad towns, while San Francisco itself had its Hot July. The stage was set for revolt. The Paris Commune was a scant seven years earlier. The existing political parties merged into a “non-partisan” alliance to contest the Workingmen's Party electoral assault. A half dozen elections in the Bay Area were won by the Workingmen's Party in early 1878, but their elected politicians turned out to be as corrupt and inept as any before them. Kearney was removed from party office by the party apparatus but he regrouped his forces, and in open meetings presented his new rules for the Workingmen's Party: the party would be guided by a council of club presidents, each president being recallable at any time by his constituency. Nominations for political office--from which all party officers were excluded--would be made in the following manner: clubs would nominate, mass meetings in each district would confirm, and the assemblage at the sandlots would render final decision. Kearney held a party convention in San Francisco which approved the rule changes and planned a statewide ticket to oppose the Republicrats (“non-partisans”) in an election for the Constitutional Convention. The Party's Central Committee under Frank Roney staged their own ignored convention and they soon disbanded, and Roney headed to temporary work in Nevada. The Workingmen's Party ended up with approximately one third of the seats at the California Constitutional Convention, facing factions as diverse as railroad lackeys to Grangers and anti-monopolists. They wrote shamelessly racist constitutional clauses suppressing the rights of Chinese people, and got them passed. They also supported the anti-corporation positions of the grangers, regulatory controls on railroads and so on, but got only symbolic language regarding improved conditions for workers. The eight-hour day, already a demand for nearly two decades, was reduced to a phrase “Eight hours shall constitute a legal day's work on all public work.” Of course, the vast majority of workers were privately employed. In February 1880 crowds of unemployed would form daily in the sandlots and march off across Market and Mission and call en masse at factories and workshops, demanding that the Chinese be dismissed. A number of factory owners complied, leading to over 1,000 fired Chinese workers. But by spring, the anti-Chinese laws had all been overturned by the courts and the factories went back to employing Chinese. By the end of 1880 the Workingmen's Party had collapsed and disappeared. It left behind a reliable and strong labor vote in San Francisco, which for many years had a large influence in state politics, although not so large as the railroad industry which basically owned it all lock, stock and barrel.